Shortly before the red and white Cessna 180 was to be suspended at the Udvar-Hazy Center for public display, I called its pilot to give her the news. Geraldine ‘Jerrie’ Mock was delighted that Charlie, as she affectionately called her plane, would be displayed again. Jerrie flew Charlie in 1964 to become the first woman to fly solo around the world (learn more about her flight). When the National Air and Space Museum opened on the Mall in Washington, DC, Charlie was displayed in the General Aviation gallery. However, exhibits changed and Charlie went to storage for many years. With the building of the Udvar-Hazy Center at Dulles Airport in Chantilly, Virginia, the Museum was now able to place stored or borrowed aircrafts back on display. 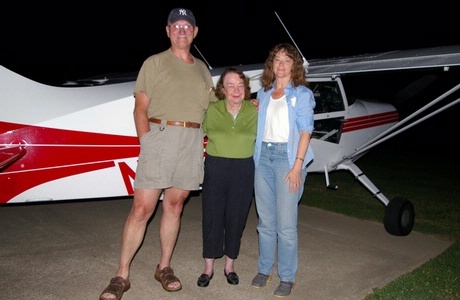 Jerrie with her ferry pilot, Vince Massimini , and curator, Dorothy Cochrane, upon arrival at Kentmorr Airpark, June 15, 2007. Photo courtesy of Dorothy Cochrane. 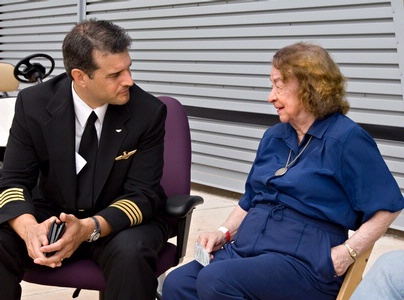 Jerrie speaking with a Northwest airline pilot at Be A Pilot Day, June 16, 2007. Photo by Dane Penland. The next morning Vince and Jerrie arrived at Dulles Airport in time to taxi to Udvar-Hazy with the other aircraft. After breakfast, I took her to the upper walkway for a straight-on view of Charlie. She was so pleased to see her plane “airborne” again. For the rest of the day, she sat in the shade of the building and chatted with visitors. Most could not believe this diminutive woman had actually flown a light plane around the world nearly 50 years ago. They loved hearing of her adventures and she loved reminiscing about the flying, the sights, and the people. “I just wanted to see the world,” she said. One Northwest Airlines captain was so intrigued with her that we had to ask him to pace himself and give others a chance to visit with her! At the end of the day we stopped to say goodbye to Charlie. Once again we thought she would be exhausted when she arrived at Margy Natalie’s home for the night (Margy is the ground boss for Be A Pilot Day), but Jerrie happily talked for a few hours more. The next day, Dave Taisch who was heading for Florida in his Mooney M20R graciously flew her home. I always admired her sheer determination to make that flight around the world, and in 2007, I saw it again when she made sure she saw Charlie one more time. Jerrie Mock embodied Nike’s slogan “Just do it!” The same might be said for those two ferry pilots who helped her make her trip for Pilot Day. Jerrie passed away this week on Tuesday, September 30, 2014. She was a feisty lady with a wry sense of humor to the end.